So I'm researching lynchings and kidnappings for this dumb book I'm working on and I see Jackie Coogan's name in a story. Child movie star Jackie Coogan, a friend of Brooke Hart from Santa Clara University, was reported to be one of the mob that prepared and held the rope for lynching. * Jackie Coogan was the kid from that Charlie Chaplin move The Kid. I guess I knew that. I dunno, Stuff falls out of my head sometimes. As Homer Simpson once said, "Besides, every time I learn something new, it pushes some old stuff out of my brain." * Jackie Coogan was Uncle Fester. The guy who was the kid in The Kid ends up being Uncle Fester? Uncle Fester was the kid from The Kid. I don't know. How do I wrap my head around that? That television show started because the kid from The Kid passed gas? So weird. 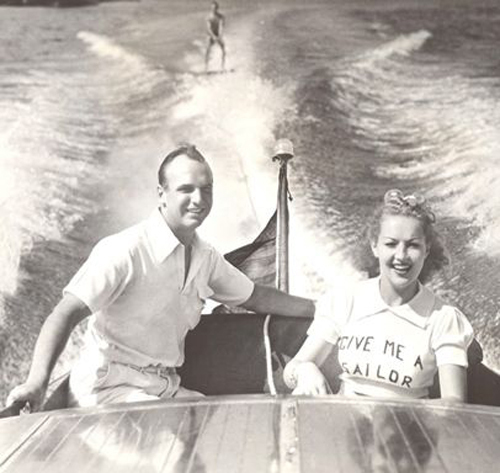 * Jackie Coogan was married to Betty Grable. I know, right? Betty flippin Grable. Was married. To Uncle Fester. The mind it boggles. * Jackie Coogan survived a car crash that killed everyone else in the car, including his father and his best friend, Junior Durkin. Durkin had been Huck Finn to Coogan's Tom Sawyer in a couple films. * Coogan volunteered for the Air Force following the attack on Pearl Harbor and served as a flight officer. He was in his late 20's at the time and served as a lieutenant. * Coogan's grandson was a child actor who was in Mork & Mindy, Laverne & Shirley, Silver Spoons, and played Brad Anderson in Adventures in Babysitting. And, of course, there's the thing about the lynching that I didn't know about. The Hart family owned a department store in San Jose, California. In 1933, the owner's son -- 22-year-old Brooke Hart -- was kidnapped and killed. The killers told the family that the son was still alive and worked for a while to get a ransom. Eventually they got caught. People in town broke into the jail where the killers were being held and dragged the two men across the street to a park where they were lynched. The governor said he was cool with it and that none of the lynchers was be prosecuted. Reportedly Coogan, a college friend of Brooke Hart, was one of the lynchers.